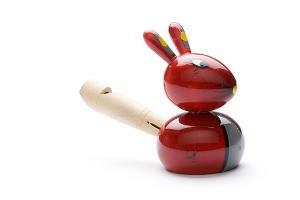 A funny and colourful wooden whistle shaped like a rabbit. This colourful and cheerful wooden animal whistle shaped like a rabbit means a lot of fun for children, but sometimes a bit less fun for parents (in case they are looking for some quiet moments and peace in the household). The warm indi colours make this wooden toy even more attractive. This wooden toy is hand made and produced out of sustainable natural wood. This wooden toy also suits perfectly as decoration for your child's room or any other place in need for some colours. This wooden animal whistle is part of our indi animal whistle collection. Make your collection (more) complete with one of the other 3 exciting wooden animal whistles! This wooden animal whistle is part of our indi coloured toys series. This series consists of our wooden toys coloured with paint made of vegetable extracts, resulting in warm and beautiful colours. Each wooden toy of our indi coloured toys series is individually branded by the natural grains of the wood and the touch of the craftsman.